As our world increases its knowledge, there are many new instruments that examine the eye using advanced high resolution technology. The method by which eyes are examined is rapidly changing. The eye doctor normally examines the eye using a slit lamp (microscope used to examine the eye), lenses, direct ophthalmoscope, phoropter (instrument used for determining the eyeglass prescription), visual field, and indirect ophthalmoscopy. These instruments have been around for many years and are still being used. The eye exam of the future is going to be much different. The phoropter has been used for many years to determine a person’s eye glass prescription. That’s when you chose between lenses and are asked which is better one or two. There are now computerized phoropters, auto-refractors, and wave-front analyzers that can be used to determine the strength of your glasses. It may not be necessary for you to have to choose between one lens or another as a computerized machine will do that for you. Instruments such as the I-Trace provide advanced technical data about the visual system. I-Trace performs auto-refractometry, ray tracing aberrometry, auto-keratometry, and pupillometry. 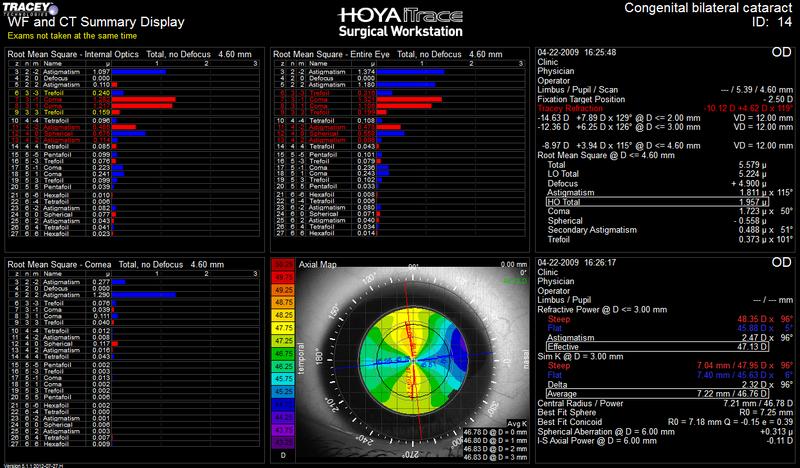 The data derived from I-Trace provides information about the optical alignment, corneal clarity, corneal aberrations, increased accuracy for astigmatism to help with astigmatism intraocular lens (toric lens) alignment, and analysis of corneal asphericity (high resolution detail about the shape of the cornea). We are learning more and more about how the eye sees. We can take that information and improve the quality of a person’s vision. You may think of this instrument as being like a CT or MRI of the eye though it is different technology. The OCT is able to scan the eye and produce very fine detail about the structures of the eye. It is able to examine the cells of the macula and show changes in the macula that are not visible to the eye doctor when they examine your eye. The OCT is able to measure the thickness of the nerve fiber layer entering the optic nerve. This provides the earliest and most sensitive method of detecting damage to the eye from glaucoma. The OCT can also image the front portion of the eye providing details of the anterior structures of the eye that the eye doctor cannot see. High resolution picture of the eye can be taken of the front of the eye and retina. These photos are valuable tools as the eye doctor can use them to follow a disease of the eye. This instrument is able to take a picture of the cells of the endothelium of the cornea. These cells are responsible for pumping fluid out of the cornea so that it remains clear for good vision. The instrument can count the number of cells present, measure the thickness of the cornea to microns of precision, and provide a picture of the cells for diagnostic purposes. The Optos instrument is able to capture a digital image of the retina. This camera makes it possible to see approximately 80% of the retina in one view. This allows the eye doctor to better diagnose problems in the retina secondary to the size of the area that can be viewed. It also has filters and auto-fluorescence to help in the diagnosis of retinal and optic nerve disease. In the future, the eye doctor may not ever look directly at your eye. They may perform your eye exam by looking at a computer monitor to evaluate your eye by looking at the results from high resolution instruments. They will be better able to diagnose eye diseases at an earlier stage. There are offices who offer that type of eye examination now.